COST: There is no cost. As always, a donation of any amount is always appreciated. Enjoy a friendly family atmosphere, delicious breakfast buffet, live music, uplifting mini movie, meet and hear an inspiring devotional by the host of Selah Radio Broadcast, Pastor Frank, meet new friends, visit/shop our ministry tables and so much more. 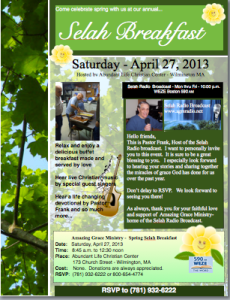 Seats are limited so please, RSVP soon to (781) 932-6222. We look forward to seeing you there!